I feel really blessed to live so close to my childhood farm. As a kid, we never moved. We stayed put on our 40 acre dairy farm, so it’s the only family home I’ve ever known. So every now and then when I come home from town, I loop around a certain way so I can drive slowly past the old revamped farm. On this particular day, I wasn’t going to go that way. I thought about it, but felt, meh… I felt lazy driving home, so I’ll just go straight. But something led me to make the valiant effort of turning the steering wheel right instead. But goodness, am I ever glad I did. 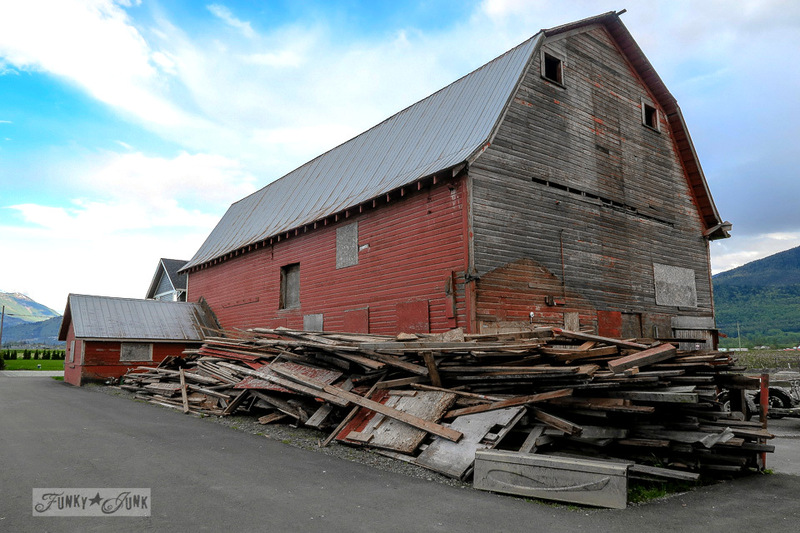 It appears the new owners were in the midst of taking one of the loafing barns down. I’ve been waiting for this day for a LONG time. I had always hoped that if they took down the big ‘ol red barn or even parts of it, that I’d be able to scoop some wood for a keepsake. You may remember the original story of the bike ride HERE. Which led to us visiting the farmhouse coming down HERE. I mulled over whether I should even bother driving in. Surely they wouldn’t mind if I took a few red boards? I really hated asking though! But I coaxed myself all the way to the door. Apparently they do have plans for the wood, but they also very generously offered me to help myself when they heard my story. I wasn’t prepared for this stop at all, so I didn’t have any gloves on me nor a hammer. So I just rummaged through a few loose boards that were easy to grab. This wasn’t the only pile either. I’ve honestly never seen destruction so incredibly organized! Which made picking through it pretty easy. As I was going through the wood, I leaned my favorite pieces up when at one point my eyes stung. This place always makes me feel like that. I really was blessed with a wonderful childhood. And I will always be a farm girl at heart. It was so hard to stay in one place too. I wanted to snoop! Look inside the big barn still standing, and just sit there and stare. Check out every nook and cranny. Touch stuff. But… it wasn’t my home to do that any longer. And I felt by just wishing it, that I was already trespassing. 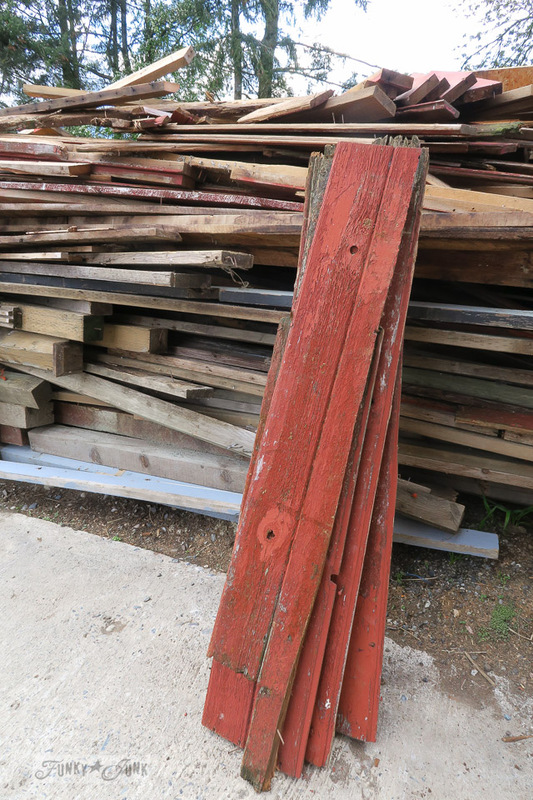 As I reluctantly threw in the last of the wood I was about to take home, I glanced up at the looming dark sky. It was about to burst with a big rain storm, so I knew my time was pretty much up anyway. While I took one more loving look around, I thanked my parents and God for the most wonderful life a farmers’ daughter could possibly have. And how fortunate I felt having a little of the infamous red barn wood for a personal keepsake. Wow, what great photos those last two are! 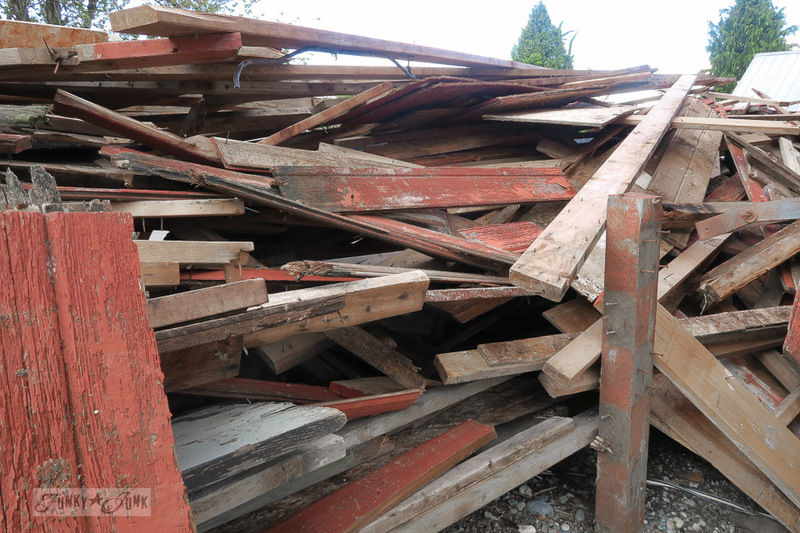 I’m glad you got to take some red pieces from your old barn, that is fabulous! I also grew up in one house… it was torn down two years ago to make way for a roadway expansion. There is nothing left anymore where it stood! This is incredible! I cried reading it!! The tears also came to my eyes. I was raised on a farm in N.J. and also had a wonderful childhood. The house still stands, but everything else is gone, so I know what it’s like for you to go back to the farm. I really enjoyed your touching stories of your farm. Thanks for sharing. Love the ideas I get from your website. That is wonderful that you got to take some of the barn with you. And the pictures…. WOW! Made me choke up…..
Oh how I love this story. Thanks for sharing. Thank you for sharing this…. I’m so glad you were able to get some of that wood… save it for that perfect project that will bring smiles forward every time you look at it, because the images in the sky….. is beyond blessings only those in heaven have the ability to share and you are so blessed to be the receiver..
What a blessing the Lord led you to drive by your old home. And for the generous and kind hearts of the new owners. Some days we just seem blessed and blessed and blessed. Now that wood is precious! Oh, a sad day it will be when it is completely down. I wished those old barns could live forever and I understand that most that are taken down are a safety issue, but still sad to see them go. Good thing you followed your urge. I’m glad that you were able to get a few treasured boards. Do you think you will just keep them, or are you going to work your magic and make something amazing with them? I love the story of your farm life! Yeah . . . . . . I think I have something in my eye, too, and a big lump in my throat. 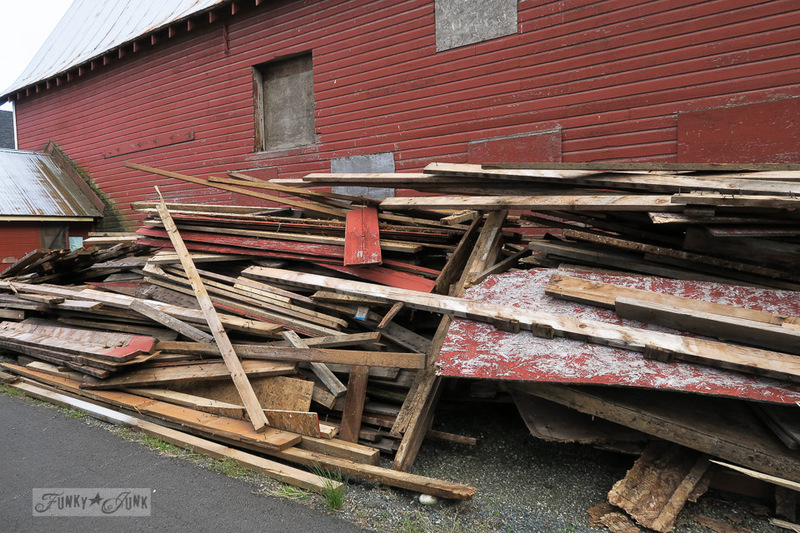 What amazing grace that you were able to grab a few memories (in the way of barn boards) from your childhood. Thanks for sharing! I believe that glorious sun shining through the clouds over your childhood home are your parents smiling down and telling your that they love you and will always be with you. That photo is definitely print worthy to keep as a reminder to look at when we miss them most. Thank you for your post!! I’m living vicariously through you! I grew up on a farm and spent hours and hours up in the hay loft playing with the kitties and moving bales around to make hideouts. As an adult and returned home to visit Mom and Dad who later moved in town, I’d always drive out to the farm. After my parents were gone, I’d every so often look at google maps and see the farm and remember. The last time I did so, the entire space was gone, the two houses, and all the red barns were totally gone, sob, sob!! I just looked again… there was a street name where the farm lane used to be. Some people call this progress, it just makes me sad. I’m SO GLAD you got some actual pieces of the old red barn. Thanks for sharing!! WOW! That is one awesome sight. That “little voice” in your head that made you take the detour is always right. Looking forward to seeing what you create with the wood. now…there is something in my eyes! I can picture you trying to coax the cows…what beautiful memories and now you have a reminder that will be nestled in your home. I am so happy for you. What great memories! How wonderful. God talks to us all the time, we just have to look and listen. Feel blessed. Aww, you’ve got me choked up too! I can’t wait to see what your special project will be for those boards. I think you need to give the new owners one of your business cards (if you have them) so that maybe they could get in touch with you if they ever decide to get rid of anything else on the farm. I so wish I still lived close enough that I could drive by the farm we had when I was growing up! In 2010 we drove across the country (US) to visit my family in Ontario, Canada where I’m from. My boys stayed at my cousin’s home (um, July in Ontario and they had a pool…or see mum’s old farm….wasn’t even a choice to them)our daughter went with us to drive in and look at the farm. It literally backs to Lake Erie. 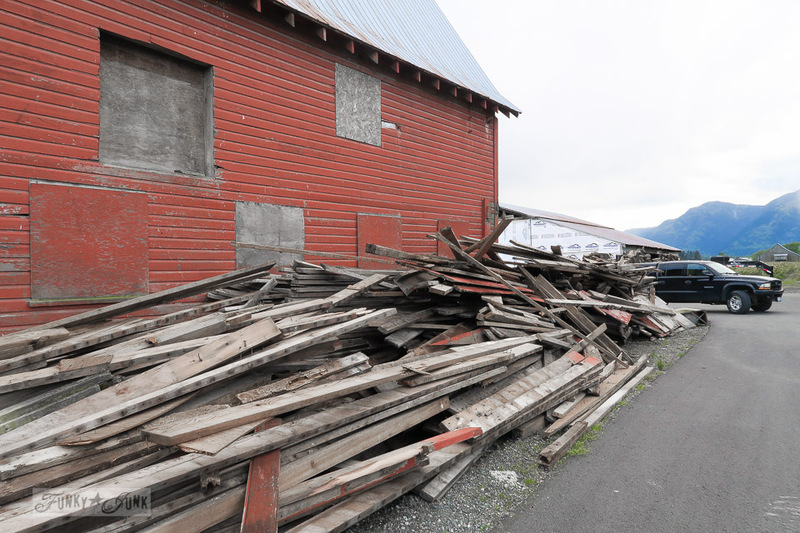 Our big old red barn was nowhere to be seen…evidently it was taken down sometime in the past 10 years. Man….I really would have liked a piece of the red-painted wood! Oh my, this story brought tears to my eyes too. I am so glad you decided to stop and take the risk. It was well worth it. Sometimes we are led to do things we don’t really feel up to doing. But after everything is all said and done, there was a reason you were led there and a reason you did what was in your gut. Cherish those wood pieces and I cannot wait to see what you do with them. That is the sweetest story ever. I am so happy for you! Can’t wait to see what you do with the boards, keep the memories alive. You were certainly blessed to have a childhood like that. No wonder you have such a strong work ethic and appreciation for life. That is such a beautiful area you grew up in and now have continued to live. Thank you so much for sharing from your heart with your readers. I enjoy your blogs so much. Memories are so wonderful even though sometimes it makes tears come to our eyes. Oh golly, I am sitting here with tears streaming down my face now. What a sweet melancholy story. I love that God put His stamp on the goodbyes. Beautiful..I hope that helped your *spirit*. It’s so hard to say goodbye to our farms where we grew up. So glad you got some wood to remember it by. The eye thing is contagious…I have it too! Blessings! Wow, what a story, what pictures. I’m a farm girl and get this big time. Glad you grabbed a bit of your history. 👩‍🌾👩‍🌾. Thanks for sharing. Shivers down my spine. How blessed you are Donna. Hugs. *sniff* and SCORE! Let us know what you build with that gorgeous wood. Oh! And maybe you’ll frame that pretty photo-a perfect gift from God. Don’t you just love the ways we know God speaks to us!! 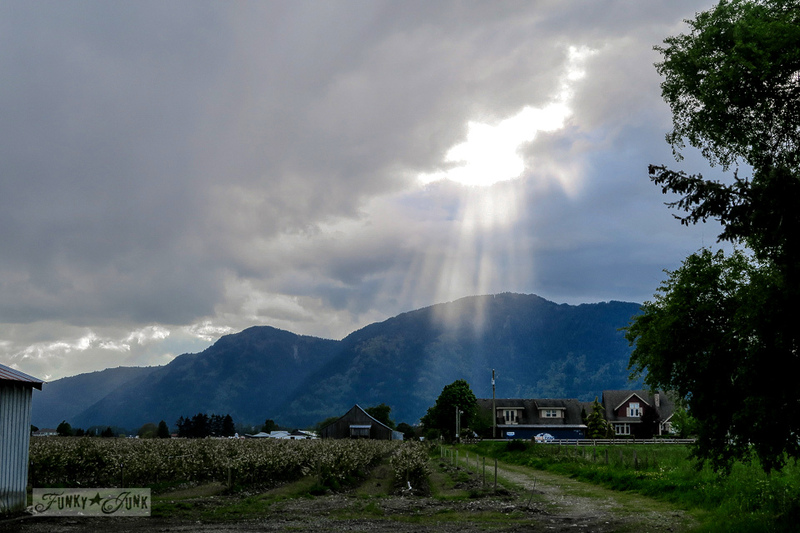 We had a similar experience when having to bury a beloved dog, a small circle opened and the sun peeped out of dark storm clouds, with brillant beams shining on his grave and no where else it seemed. We felt we knew exactly where he was! I love your story and sent to my 82 year old Mom. 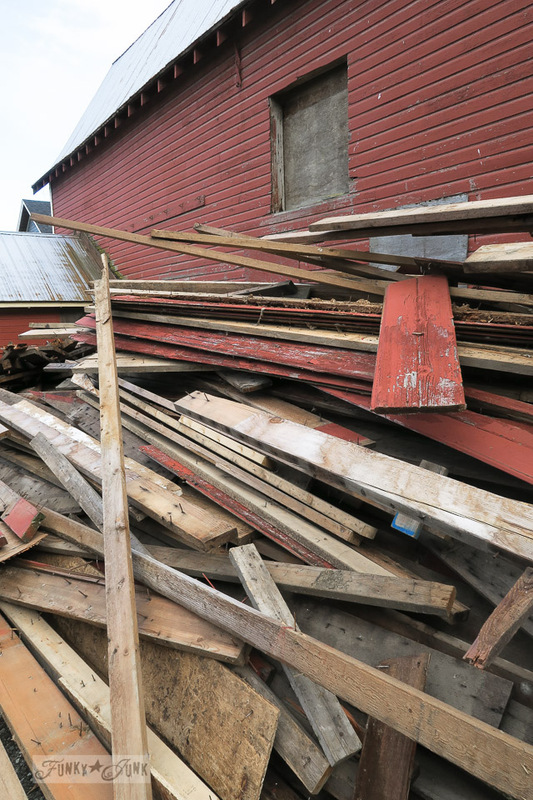 As a kid, Mom and we kids tore down a big old barn on our property one summer. Told Mom, NOW she and I both know what treasures old barnwood and the hardware is. Thanks so much for sharing this beautiful story. So glad you had the blessing of gathering a part of your childhood home. The yearning to go through and look at corners, and places. Ah, yes, I understand. Think a lot of us do. I would love to go through my childhood home once again and just stare, and stare and reminisce. Bittersweet. Oh my. And then God spoke to you through his sky and sun. I generally enjoy life very much, but getting older and leaving go of those things that are intertwined in my heart, mind and soul hurts. But at the same time, so very, very thankful. Take care dear friend. The photos are beautiful and I had a lump in my throat reading your post. What a dreamy childhood you had living on a farm. Thanks for sharing. Looks like somebody was watching over you,letting you know you were ok taking some barn wood home.Where is that?, it’s beautiful. Even tho I was born and lived in big cities when I got older tended to be drawn to open areas, farms, ranches depending where I was. I am a country girl, don’t care for city living, need the open spaces and living around people who respect privacy, being in the quiet. Can remember riding with hubs when he was trucker, loved riding mostly in farm areas outside of cities, wondering who lived in the houses, what kind of life they had. He went lot of places so we got to see much of the U.S. and Canada. I miss those trips so much, hubs retired from trucking in 2004. Now wish we could afford to travel but just not in that kind of financial position.We have 1/2 acre out in rural area few miles west of Grand Junction, CO, have 4 chickens, cat and dog.Our cat doesn’t bother chickens, he’s leary of them and dog being part border collie tries to herd chickens to keep in practice occasionally. Loved the photos of the barn and country side, good that you got a token of your memories in that barn wood. Nice of new owners to let you have some wood. Hi JaneEllen, I live in BC Canada. We have really nice country areas out here! Very natural. Your own story sounds wonderful! There is nothing else quite like country living! thank you so much for sharing this story. Floods of memories went racing through my mind. Our home is on the opposite side of the country so I do not have that option. both parents have gone home to be with the Lord so it would be a bittersweet experience to be there. thank you again for the story and the photos. Beautiful photo Donna! 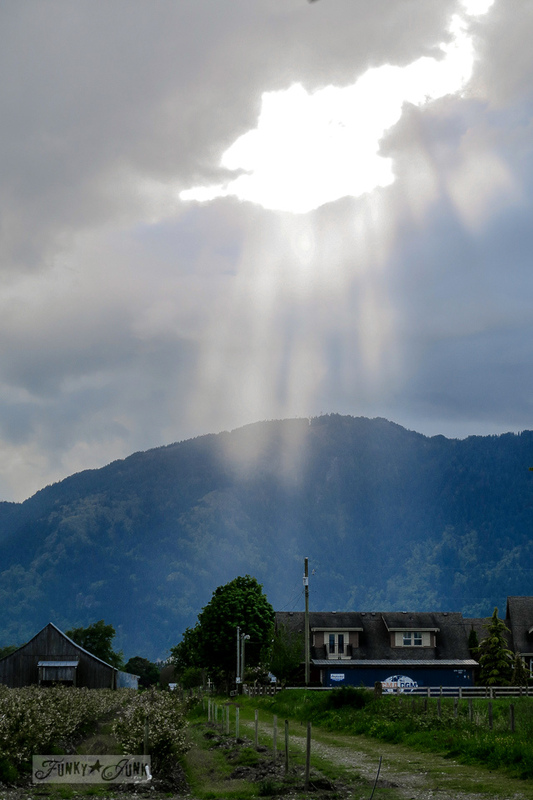 Every time I see a hole in the sky and God shining his light down on us I get all … what’s thew word. In Awe!! I’m so glad you got there in time to bring some boards home! And what beautiful pictures you got to remember that special place and the special day. God has good gifts for us, doesn’t He? Powerful…..looked like a big 👍🏼thumbs up to me. Priceless barn wood. Excuse me now, I suddenly have a lump in my throat to deal with. That’s awesome that you got those pieces. How special! So thankful they are not burning it!! So glad there’s a plan. So happy you have some child hood memories in a tangible form, to create a new memory!!! Oh my, I have the goose bumps! Sharon Jaynes (author) calls this sort of thing a Glory Moment. I believe a thankful heart brings these moments from God. You are awesome! Such an amazing sight. Those pictures are amazing. I call those “postcards from Heaven”….God smiling down on your time and memories and “kissing” you in a special way. He LOVES communicating His reality to us if we only take time to look and see! So awesome! LOVE, LOVE, LOVE this story. Thank you so much for sharing it.